During winter, we tend to get a whole mixed bag of precipitation types. During winter, we tend to get a whole mixed bag of precipitation types. These can make for difficult travel and snow days. It can be fascinating to watch from the comfort of home if you don't have to venture outside. There are four typical kinds of precipitation that we experience during the winter which are rain, snow, freezing rain, and sleet. The two most common that people understand the best are snow and rain, as 3 News Now meteorologist Ryan McPike explains. "You can still just get plain old rain this time of year. And usually, that process obviously is going to be warm from the cloud all the way to the ground. It never turns to ice or freezes, so it's always going to be in the liquid form." And the process for snow is similar, except for the temperature which is below freezing the whole time. So it begins as snow and never changes its form on the way down. Once you introduce a layer of warm air, you start to see some noticeable changes. 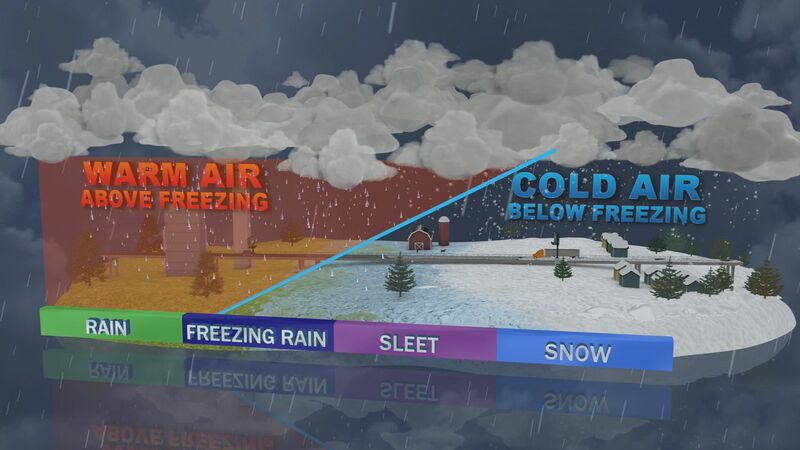 In the case of freezing rain, the water falls through a warm layer above the surface, when actual temperatures at ground level are below freezing. "It's so warm just to that point that rain never has a chance to freeze back up until it hits the ground, it'll be the liquid form, freezing on contact," adds McPike. And sleet really depends on the density of the layer of cold air under the layer of warm air, and sometimes you can even get one of the variations of sleet if just one ingredient changes slightly. "Sometimes you get what appears to be almost like a little hail stone, or almost a clear color, and then other times you get a very crystallized color or you might even get something that's white like a little pellet, but it's different. So it kind of depends on exactly how much cold air is right above the surface there," says McPike. While winter weather can cause plenty of problems, the variation in precipitation type we see is a great way to highlight the complicated structure and different levels of our atmosphere.